I have posted almost nothing about food lately. Well, at least not about anything other than bread. But I’m going to change that. Right now. Cooking with beef, besides the ground stuff, intimidates me. There are all the different types of cuts to choose from, and then there’s the browning part which is really messy, and then the baking/roasting part and the accompanying struggle to determine when it’s done, not to mention that you need to figure out what “done” means to you. It’s all very confusing and tiring. But I have found a recipe that is beyond simple. There are only five ingredients and there is no messy browning and you bake it to death so there’s no question as to when it’s done. And it’s delicious and sophisticated to boot. I made it last night for supper and then reheated it for lunch to day and there is still a bunch leftover. That’s a good thing. The original recipe calls for four heaping tablespoons of black pepper, but I use considerably less, about two teaspoons, which is a nice amount of spicy though still too hot for the young and unsophisticated taste buds of the little people in my house. Put the meat in a big baking dish. Sprinkle it with the salt and pepper. Toss in the cloves of garlic and pour the bottle of wine over all. Cover the dish well, either with a lid or some tinfoil. Bake at 350 degrees for one to two hours, and then turn the oven back down to 250 degrees and continue baking for another two to five hours. Check the meat every hour or so to make sure that the liquid isn’t evaporating away too much, adding more wine as needed. Serve with crusty bread to sop up the juices and a glass of red wine. That's all you need. A couple times a day, Sweetsie and Nickel will be struck with an inexplicable urge to don the ballerina get-up and squirrel themselves away in the downstairs bedroom (that is really not a bedroom) where they blast Wee-Sing Bible songs on a broken tape deck while they jump off the furniture. These pictures were taken over the course of two days. While looking at these photos, if you want to get the full effect, sing Rejoice In The Lord Always at the top of your lungs, while periodically stomping the floor with your foot. Then you’ll know what it sounds like around here. First, from the table to the futon. Now The Baby Nickel is breaking out the pink. What a guy, my little heart throb. In honor of my birthday, Mr. Handsome took off from work to take care of the house and kids and meals and do little projects that were high on my priority list, like installing the white board in the back hallway, hoisting boxes of clothes up to the attic, and filing the teeter-tottery stacks of papers piled on top of the filing cabinet that had been giving me the same skin-crawly feel you get when someone screeches their fingernails down a blackboard. Because he was home and because it was my birthday, the pace of life slowed down. There was another adult around who was focusing on helping out to make the house run smoothly, and I didn’t try to get anything done—I wasn’t allowed to. I declared a holiday from studies, and I didn’t have to cook or do jobs. After a non-nourishing but very rousing meal of Captain Crunch cereal, Yo-Yo Boy ordered me to get my coffee and sit down on the couch, and he then proceeded to rub my feet. Becca Boo soon joined him. I took all the kids into town and dropped them off at my Girlfriend Shannon’s house and then on to the library where I browsed through the stacks for an hour with no interruptions, making off with an ENORMOUS stack of books, videos, and magazines. And when we returned home, Mr. Handsome had lunch ready: bologna and cheese sandwiches, assembled and stacked on a plate in the middle of the table and covered with a cloth. After rest time Mr. Handsome took the two olders into town to do some shopping. Sweetsie listened to tapes and The Baby Nickel, after waking from his nap, puttsed around and cuddled with me. I read magazines, planned menus, worked on a spreadsheet for the garden, and baked a couple loaves of sourdough. At one point I pulled up a chair by the hot oven (it was a chilly, rainy day) to warm my feet while reading. Pure bliss. My Balding Bro and his family joined us, coffee-chocolate ice cream cake in hand, for the after-dinner, take-out pizza, activities. The kids were falling over themselves to give me their packages, crowding so close that I could hardly see what I was doing. Miss Becca Boo gave me a necklace with a gold cross, studded with “diamonds”, to show that I love Jesus, she explained. (She had wanted to get me a statue of Mary, like my mother-in-law has, but she couldn’t find one.) Yo-Yo Boy gave me a silver necklace with an assortment of heart-shaped baubles. From The Baby Nickel I received a bag of peanut butter cups, and from Sweetsie a bar of Dove chocolate. Other lovely gifts: an immersion blender, In Defense of Food by Michael Pollan, a coupon for an outing to Books-A-Million from my sister-in-law, and a two-year subscription to Home Education Magazine. All in all, it's a very good start to my thirty-forth year of life. An excerpt from our book, in my mother's words. Washes of pain, my husband making annoying solicitous noises and the big round clock glaring at me from the wall. My gurney ride down the night hall. Finally, at 2:28 a.m., one last burst of maniacal bearing down, my face screwed into a prune, and whoosh. They laid the baby on my belly and in a delirium of relief and amazement I gazed at this new wet, naked creature. After my husband held her a delivery room nurse put her to my breast and right away she latched on, making the staffers crow. Then they trundled her off to the hospital nursery. My husband gone, in my room down the hall I waited. They’d said I could keep her with me after the first few hours. I was way too exhilarated and wired to sleep. A laboring woman’s groans drifted my way. One nurse after another bustled in to check my blood pressure. Daylight came, and my breakfast tray, and still I waited. “How soon am I allowed to have my baby?” I asked, midmorning. The nurse’s answer came too promptly, it seemed to me. “Twenty-four hours,” she replied. I looked at her in alarm. Another more cheerful nurse contradicted, “Oh, no, eight to twelve hours. It all depends.” They both whisked away. Was there trouble? I recalled how quiet the baby had been at first. Right off, she’d made just a tired little squeak. But then she’d wailed loudly—she’d cried hard. She’d looked perfect. Had something gone wrong? A snippy nurse brought me pills, tiny red ones. Didn’t they give women pills to dry up their milk? Where was my baby? “What are these pills for?” I blurted. “To put your tummy back in shape.” The nurse acted in too much of a hurry. People were whispering out in the hall, and the doctor strode in. He asked how I was feeling. He’ll think I’m some kind of a nut, I thought. But I questioned him anyway. “Something wrong? No, no, no. Your baby’s in the nursery.” But he was too hearty, reassuring. Wasn’t this how people acted when they lied? Knowing I might as well face the truth, I persisted. “Can’t I at least see her?” He glanced at that snippy nurse who’d come in with him, and they agreed to find someone to accompany me to the nursery. I padded weakly down the hall behind her and stood at the nursery window. I could see three babies. The one way back in the corner, the nurse said, was mine. But back in bed again, I counted in my head. One woman had delivered soon after me; I’d heard all her caterwauling. A second woman had birthed a bit later; she occupied the other bed in my room, now. Surely several babies had been born before ours, or a few since. Why hadn’t they brought my baby’s crib up close to the window? They hadn’t wanted me to read the identification tags! They’d shown me somebody else’s baby! The obstetrician’s office called to say congratulations, but of course they were in on the plot. I scolded myself for worrying, and I kept hoping that what I dreaded hadn’t happened, but the fear clawed and clenched at my heart. Not until after lunch, around 1:00, did they bring me my firstborn. What an astonishing wee, fuzz-top mite! My soft mewling, nuzzling bundle! My parents came chugging into the maternity ward a short time later. When I told Mother about my crazy spell, she smiled. “Oh, that’s normal. I went through the same thing.” Really? This, yet! If women typically suffered these private spasms of terror, postpartum, why hadn’t somebody clued me in? Were such fears some big shameful secret? Cuddling my baby, drinking in her milky, warm sweetness, I was wholly smitten. 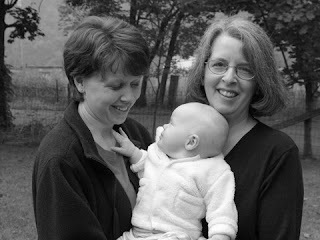 I’d had no idea, no idea at all, of the intensity of affection I would feel for my infant. My maternal instinct—the tiger ferocity—just shocked me. Sweetsie had a little run-in with hot peppers last night. I was picking red raspberries in the garden when Sweetsie came out to join me. She picked some berries and then started poking around the garden, chattering all the while. I noticed she was looking at the long, red banana peppers, but I didn’t think much of it. Next time I glanced up I noticed she was handling them, examining them with her fingers, but I still didn’t think much of it. When she started screaming and rubbing her eyes, I still didn’t put two and two together. I thought that she probably got stung or maybe a grasshopper had jumped up and hit her in the face. She had to repeat herself several times before I could make out what she was saying—Oh! She got peppers in her eyes! I took her in to the house and flushed out her eyes with cool water and washed her hands good. I gave her a cold washcloth to press against her eyes and went out to finish picking my berries. She was still fussy, so Mr. Handsome washed her hands again, this time using some of his special, heavy-duty soap. It wasn’t until supper time that she started complaining about her mouth hurting and we noticed that her lips were extra red and the area around her mouth was red and puffy. We told her not to rub it, and we gently washed it, and then put her to bed. By the morning she looked like this. I made her step out on the deck so I could get some pictures in the natural light. She still looked about the same this evening. I made her stand still for a little photo shoot. She wasn't too pleased about it. She was getting fed up. She says it doesn’t hurt too much anymore, but I don’t think she’ll be playing around the peppers plants anytime too soon. He makes a very cute little girl, no? Because it doesn’t bother me one wit. I think it's sweet that he's so in touch with his feminine side. This past weekend our church had its annual retreat at a camp that’s located about twenty minutes from town. Lots of the church members set up their tents and campers for the weekend, but we opted to drive home every evening for the luxury of sleeping in our own beds. And because I hate camping. And because I know that the kids wouldn’t sleep well and then they would get grumpy and then I would be miserable. Church retreat has the potential to be an awful lot of fun... or not. This year it was definitely an Or Not experience for us. This was mostly due to the stage of life that we are in right now. You know, the Four Young Children Stage which is compounded when the two small ones have an intense aversion to being babysat or going to sessions with their peers without a parental figure hinged to their side. On the other hand, the theme of meditation was not a good one for families with young children. Meditation is a good and worthy theme, certainly, but it doesn’t sit too well with little kids because little kids don’t sit. Yes, there was childcare (some of the time), but as I said before, my kids have issues with that. The dear people on the retreat committee planned Taize services (which I normally love) and long times of quiet and a Labyrinth and evening prayers and Yoga and so on. All good things, and very needed for some people (especially us? ), I’m sure. But for Mr. Handsome and I, they were only good for raising our blood pressure and making us want to swear. For example, there was a lot of outdoor worship---we were at a camp, after all. That meant that there was a large group of adults sitting down in the woods in the midst of all the trails that linked the cabins to the dining hall to the chapel, and every single noise that anyone made while walking on those paths could be heard by the quiet, meditative adults. Most of the kids were with their different activity groups, except for my two little ones. So one of us had to chase them about while the other person got to attend a session. The chasing person was totally stressed and lonely and miserable, so the person who was having a break was not able to fully relax and enjoy the experience. I think this is what you call a lose-lose situation. Saturday morning it was my turn to attend a session and Mr. Handsome had The Baby Nickel and Sweetsie. All us adults were sitting there, down in the woods, thinking our ethereal thoughts (and freezing our tails off) when I heard Nickel’s voice, clear as a bell, telling Mr. Handsome he wanted to go that way. And Mr. Handsome answering, “No!” and then Nickel insisting and then Mr. Handsome insisting more firmly and then Sweetsie and The Baby Nickel screaming. The guest speaker said some nice and true things about how children are life and we should not be bothered by the noises they make and I’m sure most everyone agreed and didn’t mind too much. Except for me. I mean, he’s certainly right, but when you are in charge of controlling the noise volume of the little full-of-life squirts so that others may pray, it does not feel very life-giving. Then on Sunday morning it was my turn to take care of the little ones. The congregation met down in a huge field by the pond and everyone sat on blankets and chairs and there was beautiful instrumental music and Scripture readings but I only got to listen for about two minutes and sixteen seconds because The Baby Nickel and Sweetsie were fussy and ritchie, and they wanted to leave. And then they got louder and louder and LOUDER, so I picked them both up and hauled them away. Except there was no “away”. We were stuck in this big field, no building to run into and close the door and no car to slip inside (at least not ours),and even when we were on the dirt road heading up to the playground, everyone could still hear my children shrieking as though they were being murdered. Occasionally I clapped a hand over Sweetsie’s wide-open screeching mouth, but I couldn’t do that for very long because then I would have to let go of The Baby Nickel and he would turn and try to make a dash back to the service. There was nothing I could do but keep going, so I marched along with a steely look on my face and an iron grip on their little wrists, half of the time lifting their arms high so they had to dance along on their tippy-toes and the other half of the time, when my arms needed a break, dragging them along beside me, mentally hurling curses at church retreat. I wanted to get out of there so badly that I could feel my skin crawl. I wanted to jump out of my body and just leave. Mr. Handsome eventually rode up behind us on a bicycle (they really could still hear the kids). I told him to go get the van, and he met us back at the park which we had finally reached and where I promptly collapsed on the swing. Mr. Handsome went back to the service (where the other kids were supposedly waiting calmly and quietly) and Nickel and Sweetsie eventually stopped fussing and started playing and I read my book. Mr. Handsome muttered to me that we were “retreating from retreat”, and we both laughed, so enormously relieved to be done with the weekend and heading home. Our house is even strategically placed (not by our doing) in such a way that it sits up at the front of the property right by the road and from the kitchen windows (which are our doing---I envisioned and demanded them and Mr. Handsome installed them) I can see out over the whole five acres. But the knocks still happen. The other day The Baby Nickel took a fall. He was climbing the ladder that led to Yo-Yo’s fort when the ladder tipped over and fell. (Thankfully, he did not hit the edge of the doghouse roof---he has already been injured on that thing.) The kids say he landed head first. On a rock. Ouch. I washed him up and tied a diaper around his head as a makeshift do-rag. He didn’t want to move around much (he probably had a whopper of a headache) and kept slumping over in the swivel chair, trying to fall asleep. It was the perfect opportunity to take some close-up shots of him, something I don’t normally get to do because he’s always in motion. Isn’t he a perfect picture of pathetic peacefulness? He has fully recuperated now though he still winces when I wash his hair. I haven’t seen him on the ladder since then. Maybe that hard rock knocked a little sense, or at least caution, into him. I made this salad yesterday, and I’ve been living off of it ever since. It is well-balanced (includes all the food groups) and quite filling. Also, it stores well, so just make a batch of it first thing in the week and your lunches for the rest of the week are all taken care of. Cook the rotini, drain, and set aside. In a small bowl, combine the lemon juice, olive oil, salt, pepper, oregano, and garlic. Stir well and then add to the pasta. Add the rest of the ingredients, toss gently, and serve. My baby is alive! I did it! Yippeeeeee! We will soon be feasting on bread, bread, and more bread. YES! There are many thoughts and ideas floating around in my head. I could pick out just one to write about, or I could try to tie them together into one neat little package, but I've decided against that since it would take effort and discrimination, two characteristics that are not in my possession at the present moment. Instead, I'm going to write about all of it. Reallyreallyfastandallatonetime. Splat. Paprikahead posted about some cornmeal peach muffins. I put the recipe aside, thinking I’d make them someday, but then they somehow slipped onto Saturday's “To Do” list, so yesterday I made them in time for lunch. Instead of peaches, I added chopped up pears, red raspberries, and blueberries. I think I maybe ate four. Every summer I would make two big springform pans of this torte, and once it was all assembled and frozen solid, I would slice it into serving portions and wrap them up individually and stick them back in the freezer. It was so simple to pull out a chunk, set it on a big plate to thaw, and ring it with crackers. I take it to church potlucks, serve it at parties, and pull it out as an appetizer or to bulk up a meal. People always rave, and that makes me feel good. This summer I decided I wasn’t going to make any of the torte. I still had one chunk left in the freezer and I just didn’t feel like going through all the work. But then my Girlfriend Shannon asked for the recipe and made it and talked about it, and then my Girlfriend Gen asked for the recipe and made it and talked about it and took pictures of it and posted about it. And then my Aunt Valerie copied the recipe from Gen’s blog and made it and called me with questions about it. I was starting to feel the pressure. So when I was in the grocery store a couple days ago, I picked up the cream cheese. I looked at the containers of ricotta but since I hadn’t calculated how much I would need, I bought a gallon of milk instead. I figured I would just make my own ricotta. Huh? Yeah, I know, I'm crazy. But somehow at the time it had seemed like a sane, rational idea. So yesterday, while we were in the middle of making grape juice and flailing and sorting dried beans, I made ricotta and then two pesto tortes. Let me tell you, I was not thinking clearly that night in the store, because all the while I was making the ricotta I kept having visions of colorful plastic containers filled to the brims with ricotta. What was the problem with buying two or three boxes of ricotta and having leftovers? You got me there. I’ve ordered a lot of my cheesemaking supplies from Ricki’s store, the New England Cheesemaking Supply Company, based in Ashfield, Massachusetts. Pour the milk into a large kettle. The citric acid causes it to curdle a little bit almost right away. When it’s almost to the boiling point, the milk will turn from it’s creamy white color to a yellow-greenish color, signifying that you now have curds and whey and the cooking process is complete. Dump the whole mess into a cheesecloth-lined colander that’s sitting on top of another large kettle or bowl. You can save the whey to use in other recipes, for example, in place of water when making bread. Hook the corners of the cheesecloth together and let hang for about 30 minutes. (I bind my cloth together with a sturdy rubber band, push a chopstick under the bands, and then lay the chopstick over my coffee mug hooks. Necessity is the mother of invention, yes indeed.) Make sure to put a bowl underneath the bag of cheese to catch the whey that will drip-drop out. and pour a couple glugs of cream over top. Add another ½ to 1 teaspoon of salt and stir well. When my Girlfriend Gen made the torte, she actually called me to see if I would mind if she posted the recipe. Of course not, I declared. However, once I made the torte, I developed a hankering to include it in my recipe index. I mean, it is one of my standbys. So I called Gen and asked if she would mind if I’d include the torte in my index, only link it to her post (I have no desire to go through the whole process of typing up the recipe, especially since Gen has already done such a fantastic job of that already). Of course not, she declared. So, here’s the Pesto Torte we’ve all been declaring about. Now, after I had made the cream mixture for the pesto torte, I just happened to get out some muffins for the kids to eat as a snack. As I was tearing the muffins in half, on the counter right beside the bowl of ricotta-and-cream cheese mixture, I got an idea. I spread some of the cheesy cream on the muffin. Oh my lands! It was a perfect combination: ricotta and cream cheese on a fruity cornmeal muffin. I’m filing that cream mixture recipe away, ready to be used the next time I serve these muffins, or any hearty muffin, for that matter. On Friday evening Mr. Handsome decided that it was time to pick the grapes (that’s the polite way of saying that I told him he had to go pick grapes now). Here he is on the ladder, picking away. He is not really being a friendly person, waving to the camera, in the following photo. He’s actually winding up to hurl a grape in my general direction. He wanted me to come help him pick, but I was refusing, preferring instead to take photos of him picking grapes and then to sit on the deck shelling the black beans with Sweetsie and listen to him mutter about how unhelpful I was. I had ordered a pack of fifty Cherokee Trail of Tears Black Bean seeds from Seed Savers, which yielded about a quart and a half of hard black beans. I will save nearly half of the seeds for next summer’s planting, and the following winter we will feast on black beans. These yellow-brown beans are called Boston Favorites. I think. (I planted several different kinds and didn’t mark where I put them and not all of them germinated so that’s why I’m a little confused on the identities of my beans.) They don’t seem as hard as a dried bean should, and they are a bit yucky and moldy. We’re having to pick through and throw out a lot of them, so I probably won’t save any of them for next year’s seed. Our main crop of dried beans is our Nicaraguan red beans. When Dad and Mom came to visit us in our little adobe house that we built with our own hand in the northern hills of Nicaragua, Dad took home a bag of the beans and planted them in his garden. They’ve been growing the beans ever since, and now we have inherited seed from him and are planting our own crop. We don’t sit around and shell these red beans. Instead, Mr. Handsome does like a Nicaraguan and flails them. He sets a pile of them on this wire mesh and pounds them with a stick. and pounds them some more. All (most) of the beans land on the tarp and he then discards the dried pods and pours the beans into a big tub. Then he winnows them (pours them in front of a running fan) to remove most of the chaff. We still need to pick through them even more, but I’ll do that later. This year we got close to forty pounds. In case you’re interested, here are our fingerling potatoes. You can see some of the onions in the background. But back to the grapes. Normally, to make grape juice, we just plopped some grapes in a quart jar, added sugar, and then filled the jars up to the top with water and canned them. But this year the Grand Matriarch gave us a juicer as a joint birthday present, so we are playing around and experimenting with our new toy. We are finding that it makes a very nice, rich grape juice concentrate of which we have so far turned out twenty quarts. We have hardly made a dent in the grape population, so I’ll be doing a lot more, plus maybe some grape jelly. Here is Miss Becca Boo, walking on our porch railing and simultaneously eating grapes. My kids are extraordinarily talented. First thing this morning, I heard the chickens cackling up a storm. Upon investigating, I realized there was a rabbit stuck in their fence, thrashing about wildly. (It’s an electric fence, but it wasn’t turned on, which was fortunate for Peter C.) What is it with rabbits and fences on our property? I saved the rabbit for Mr. Handsome and when he finally came downstairs I informed him that there was an execution job awaiting him (remember, I’m a gardener, kind of, and all gardeners have the secret middle name of McGregor). But what do you think he did? He went out there and freed the little bugger! Whew. I'm feeling a little depleted and worn out, now that I've spewed. I think I need to go lay down.